This is impressive model agreement and indicates that they have a good handle on the strength of this trough. 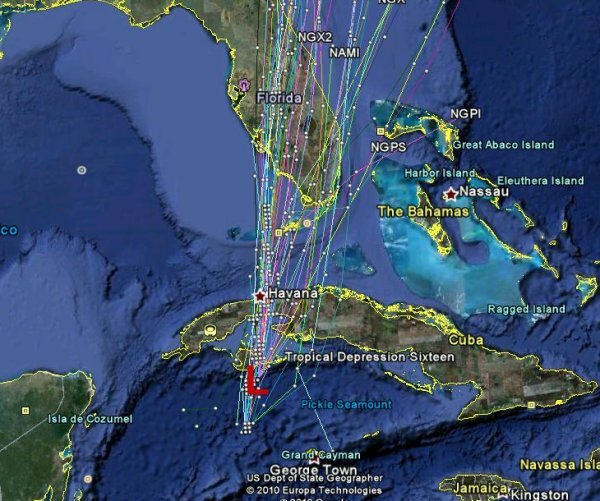 Despite extremely warm water in its path, there probably isn’t enough time for it to strengthen into a hurricane, and shear associated with the trough is expected to increase before it makes its landfalls in Cuba and Florida. The SHIPS model shows a modest increase of 28 knots in the storm’s intensity before it weakens again. In the longer term, this system—along with its predecessor, Matthew—probably heralds a shift in the type of tropical cyclone that will be forming in the remainder of the season, as well as the likely players that will be influencing the path of whatever does form. With the demise of the persistent ridge that brought the Southeast such oppressive heat for weeks upon weeks, and the establishment of a fall-like troughing pattern, we should see a greater threat to the Gulf Coast from anything that brews up—and, statistically, it is approaching the time of year when the Cape Verde conveyor belt shuts down and the tropical threat from “home-grown” systems increases. Additionally, this is a La Nina hurricane season; those have a tendency to start late and finish late, and by no means should the Gulf Coast consider itself safe from threats, including significant systems. In 1999, also a La Nina year, Hurricane Lenny almost reached Category 5 status in November. Even last year, during an El Nino, Hurricane Ida entered the Gulf in November and reached Category 2 status. We’re still in this.